Cruse Andino’s Andean crossing is an ever-changing example of nature at its finest. 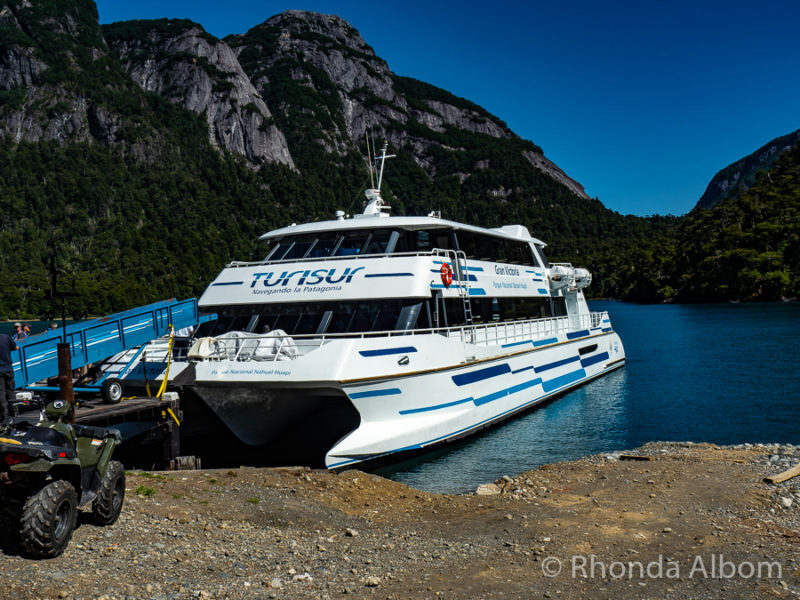 Turning a day of transit into a spectacular adventure, Cruce Andino transported us over the Andes mountains, from San Carlos de Bariloche to Puerto Varas. As we travelled from Argentina to Chile we sailed across three lakes, drove through a rainforest, viewed volcanoes, and discovered waterfalls. It was a twelve hour day that I didn’t want to end. 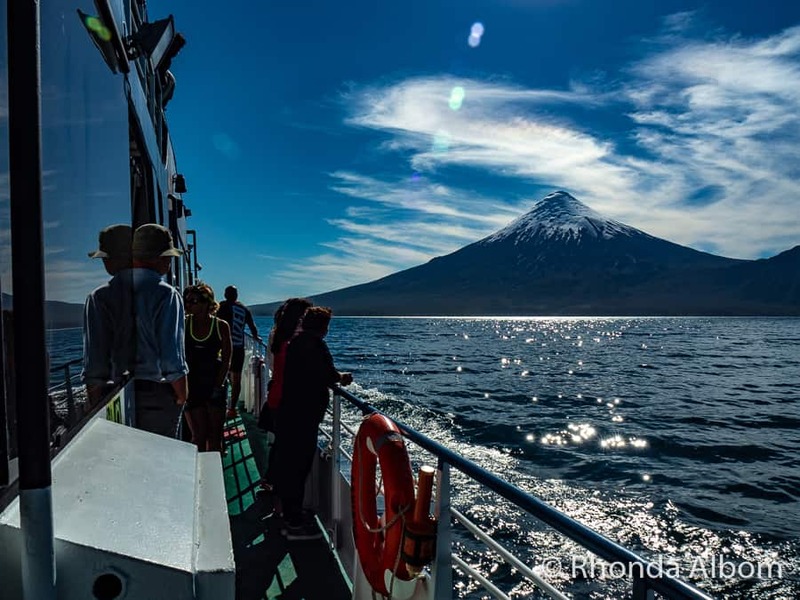 Osorno Volcano seen while sailing on Lago Todos Los Santos in Chile with Cruce Andino. The crossing is done in seven major segments (three on boats, four on buses) plus a stop at immigration and another for lunch. If you are like me, don’t be put off by the idea of bus travel. No segment is too long, and the scenery is so picturesque that the time whizzes by. 15 What segment of the Andean Crossing will be your favourite? Have you travelled with Cruce Andino? I’ll admit, waking up early and walking to the Turisur office with our luggage felt a bit like a chore, but it was the last one of the day. From here, Cruce Andino took our luggage, and we barely saw it again before reaching Puerto Varas. Our first bus provided comfortable transport from the city of Bariloche to the port, stopping at designated hotels just outside the city to pick up other passengers. With both lake and forest views, it was a pleasant ride. For the best lake views, sit on the right side of the bus. 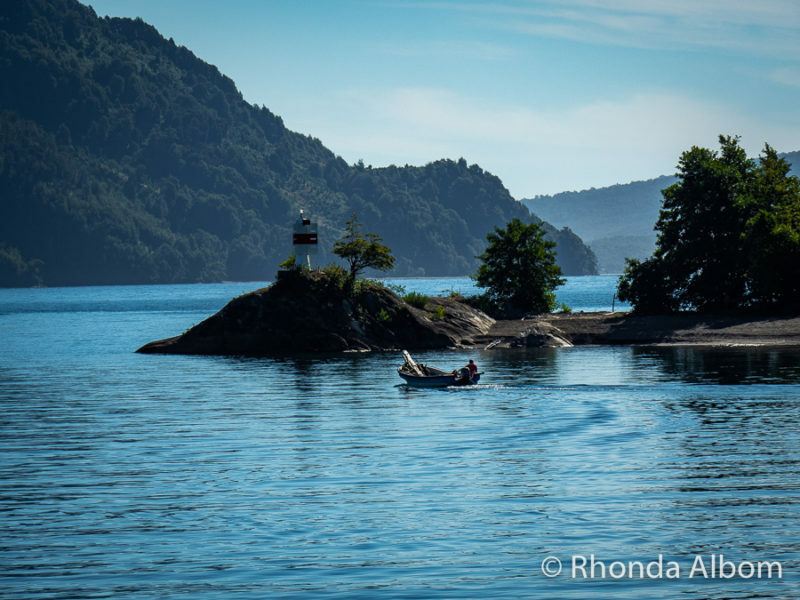 For us, this was the third time we did this segment, as we had been to Puerto Pañuelo, Bariloche at the start of our adventure to Isla Victoria and also when we completed the tourist short circuit. After exiting the bus, we paid a port departure tax of 72 pesos per person ($2 USD). Then we boarded the Gran Victoria catamaran, and for me, this is where our adventure really began. Huge windows, the option of tables or row seating, and outdoor decks provide the ideal spot for everyone’s tastes. 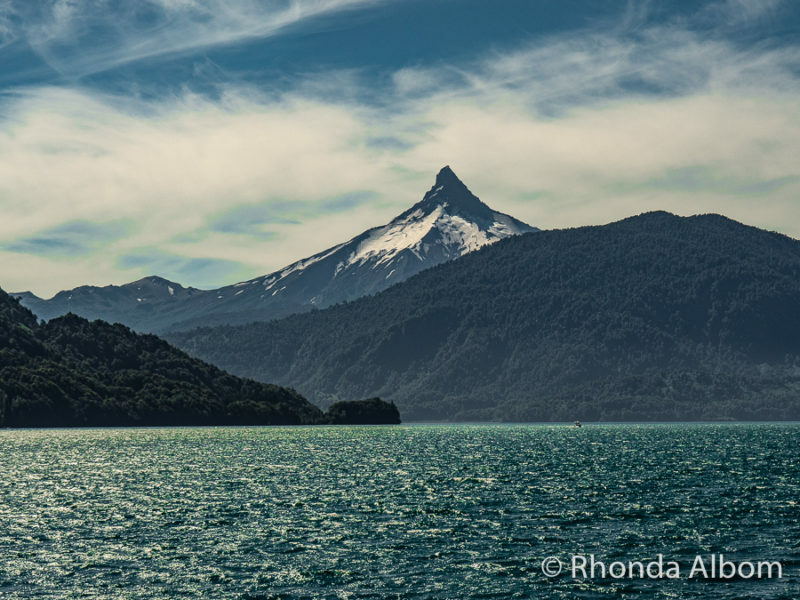 Saying goodbye to Bariloche, we cruised down the Blest arm of Lake Nahuel Huapi inside Argentina’s national park of the same name. Like the other Andean Lakes, Nahuel Haupi is a glacial lake, the cold water reflecting a rich teal. 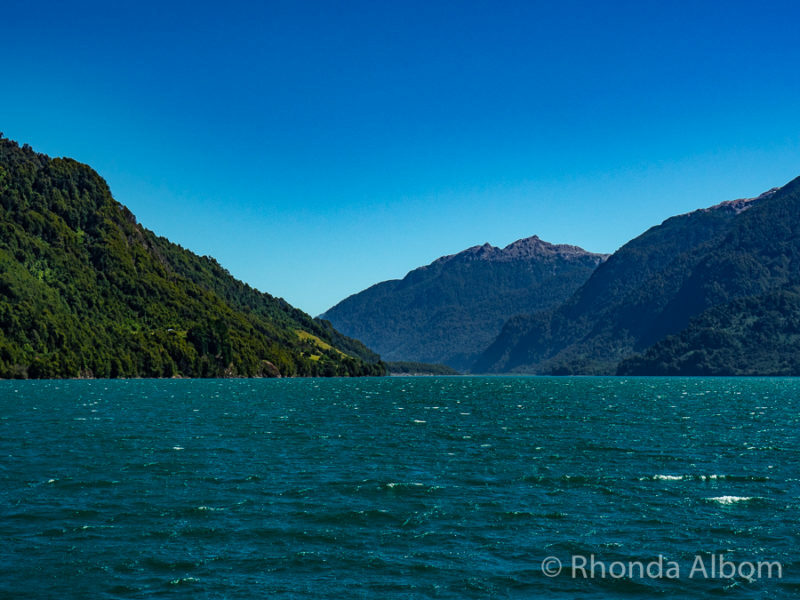 Cruising down the Blest arm of Nahuel Huapi Lake. We got lucky with the weather and had clear skies the entire day. The Gran Victoria sailed smoothly. I will always choose outdoors on a boat and checked out the decks first on the main level, then the upper level where I had an opportunity to feed a seagull. I thought this was going to be the highlight of our crossing, but it continued to get better. This is me, hand feeding a wild seagull. Photo Credit: Gisel Badila. Used with permission. Our first stop was Puerto Blest, a small town that hosted former US President Theodore Roosevelt in 1913. A short break here allowed us to take photos, use the facilities, buy a snack, or walk on the beach. The Gran Victoria docked at Puerto Blest, just after we all disembarked. 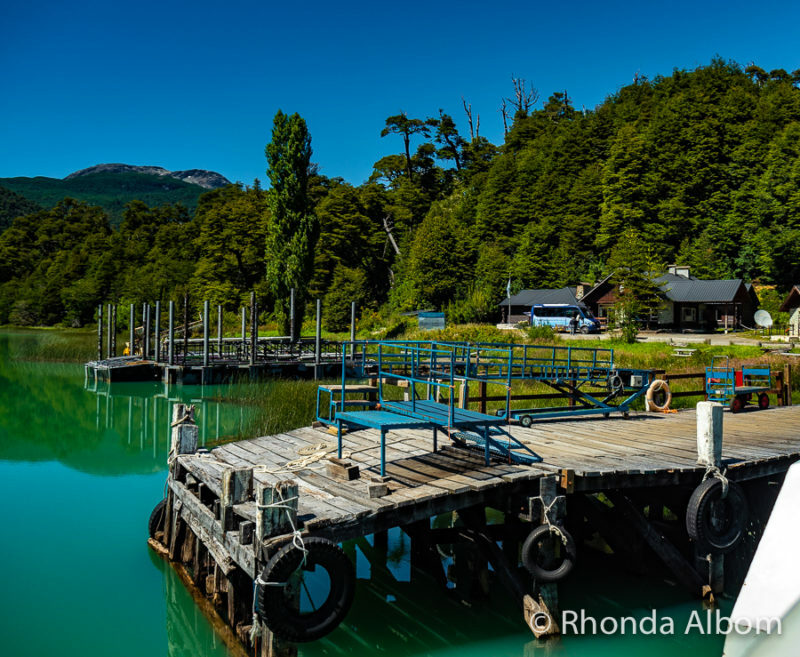 An alternative to the Andean crossing, many people opted for a day trip to Puerto Blest and returned to Bariloche from this point. A map of the region shows a river connecting Lake Nahuel Haupi to Lago Frías, but it is not navigable, therefore the need for the bus. As the drive was only about 10 minutes, we didn’t stop. Therefore, the photos were shot through the moving bus windows, and don’t appear here. The Victoria Del Sur, this segment’s boat, was much smaller than the first one, but large enough for our shrinking group of those doing the full Andean Lakes crossing. An outdoor upper deck is as far as I ventured into the boat. Jeff checked out the lower deck that had a small outer area and large viewing windows for those who prefer to be indoors. As we pulled away from Puerto Alegre, condors glided overhead, their magnificent wingspan impressive, even at a distance. This short cruise crossed the deep green Lago Frías (Cold Lake). 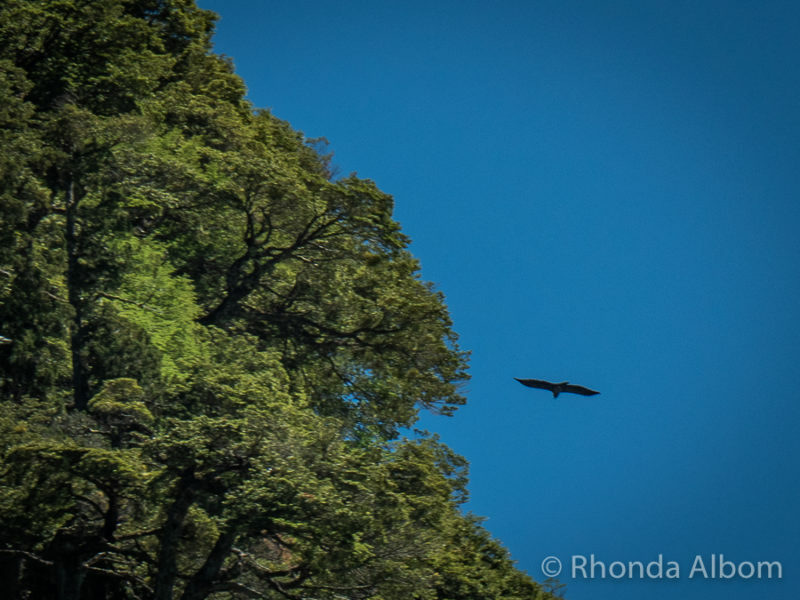 This is one of several condors soaring high overhead as we departed the pier and sailed across LagoFrías. 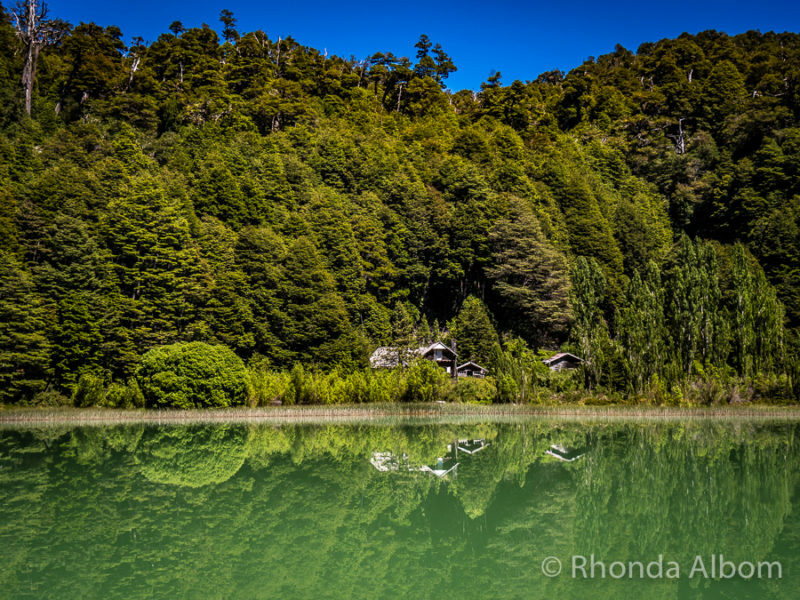 It is the reflections in the vivid jade-coloured lake that caught my eye. Lago Frias, with colours reminding me a bit of the Hokitika Gorge in New Zealand. Once in Puerto Frías we said goodbye to Argentina officially. We had to clear immigration, a somewhat slow process that went smoothly. Just outside the immigration office is a display featuring the route and a replica of the motorcycle that Che Guevara rode travelling from Argentina to Chile. As we pulled into the port after crossing Lago Frias, we could see the Argentinean immigration building ahead. The bus used for this segment was the weak spot of our journey. Small, and only slightly more comfortable than a school bus, every seat was needed for the passengers, many of whom had to sit with strangers. You can see it in the photo above, waiting for us outside Argentina’s immigration building. Puerto Frías is at 700 metres elevation. From here, we climbed 300 metres to the road’s summit, where we stopped to take photos as we crossed the border from Argentina to Chile. The actual border between Argentina and Chile, located in the Andes mountains. We got a second break after another short drive, thus making our time on that bus not seem so bad. 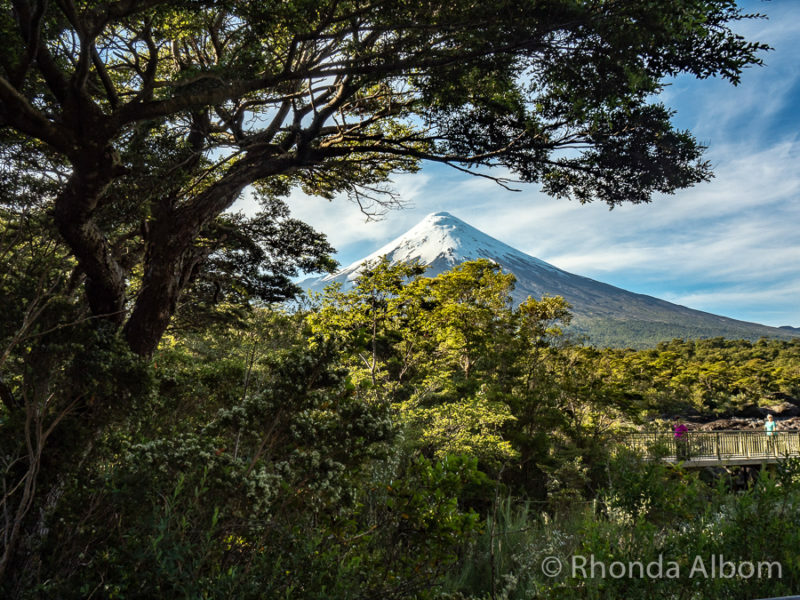 Our next photo stop provided views of Tronador, the tallest volcano in the region standing at 3491 metres (11,450 ft). It last erupted in 1934. Cerro Tronador, the region’s tallest volcano. 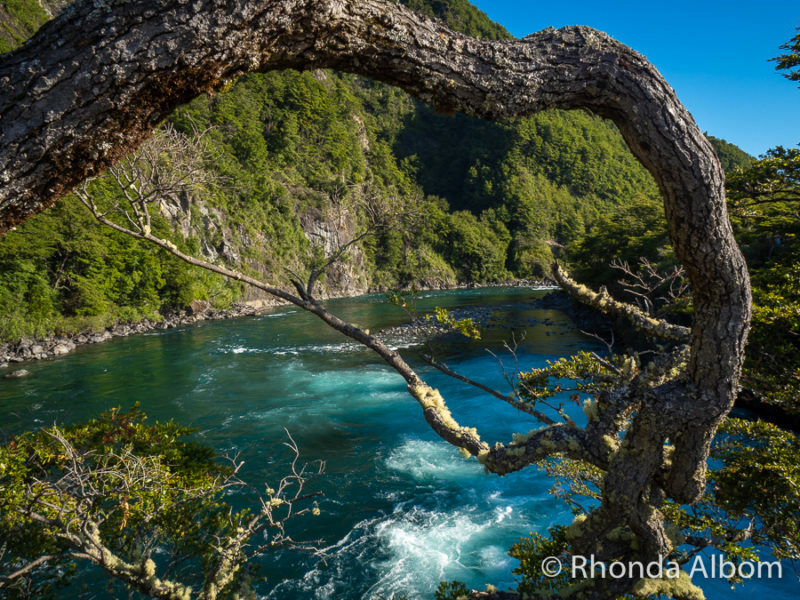 Returning to the bus, we continued downhill through the evergreen rainforest to the town of Peulla, Chile. This area gets more than 3,000mm of rain annually, and according to our guide, it rains on average 230 days per year. One of the Chilean forests we passed through. 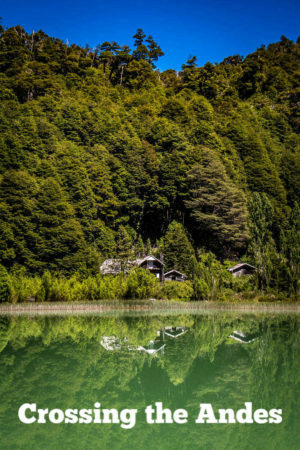 Peulla is a small town located inside the Vicente Pérez Rosales National Park (Chile’s first national park) with a population of only 120 people, which includes our guide. Here, we cleared Chilean customs, before having two hours for lunch. As our guide warned us, customs opened every suitcase and backpack to check everything. So glad I use packing cubes, as repacking our gear was quick and simple. Our options for lunch included bring your own food, eat in the restaurant at the historic Hotel Natura Peulla, or at the cafe next door. There was enough time after lunch for a coffee or beer, or for a walk to the water or around the grounds. Unfortunately, I was a bit intimidated by the massive number of swarming Tabanus, an insect that looks as though it’s a cross between giant flies and bees, and apparently bite. Natura Hotel seen from the bus as we approached Puella with Cruce Andino. There is plenty of active things to do in this town for those who chose to make the journey a two-day trip and stay here for the night, thus joining Cruce Andino the following day. Next, my favourite segment. 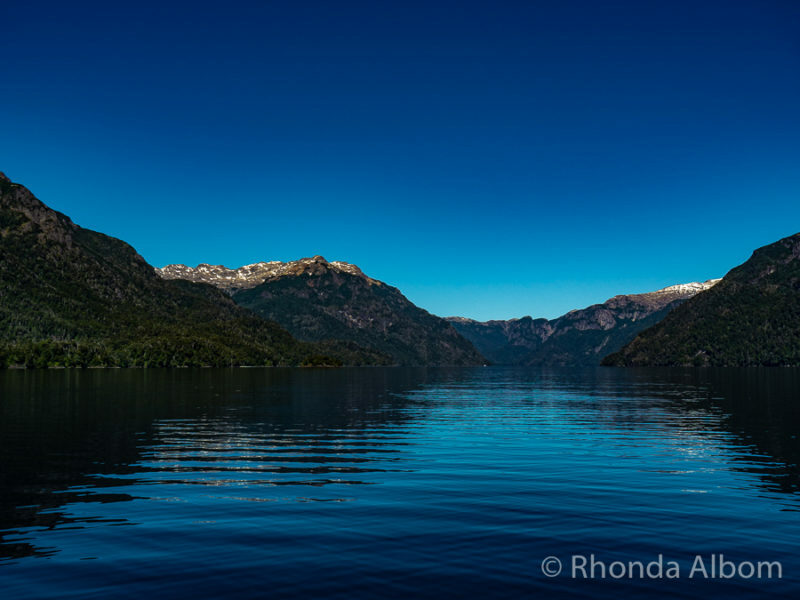 We sailed for two hours across the Todos Los Santos Lake in Chile on the Catamaran Andean Lakes. One spectacular view after the next and finally, nature’s masterpiece, Osorno Volcano. Standing tall at 2652 metres (8700 feet) she is a stratovolcano, a near perfect snowcapped cone. She last erupted in 1869. To our surprise, we had to pick up our luggage as we exited the boat and bring it to the final bus, a new, modern, comfortable coach with a toilet onboard. It was the ideal way to travel by this point, as we were getting a bit tired. Our final bus segment was broken up when we stopped for 30 minutes to visit the Petrohué Waterfalls. 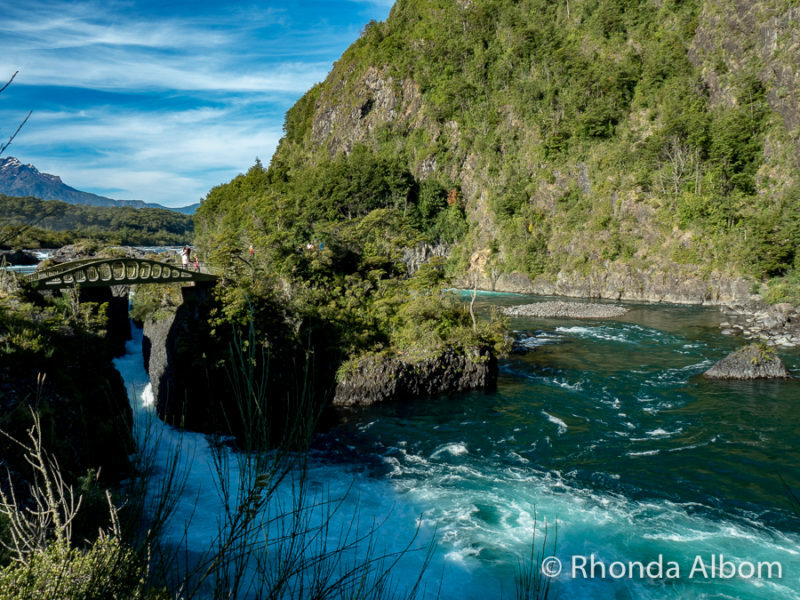 With Osorno as a backdrop, the rushing water created views worth a visit. We arrived at 6.45 pm and our driver hurried us, insisting we follow him without stopping. Once we reached the pay area, we understood. The last daily entry is at 7 pm. Petrohué Falls are not that tall, but quick, and powerful. Check out the colours in the water just beyond Petrohué Falls. 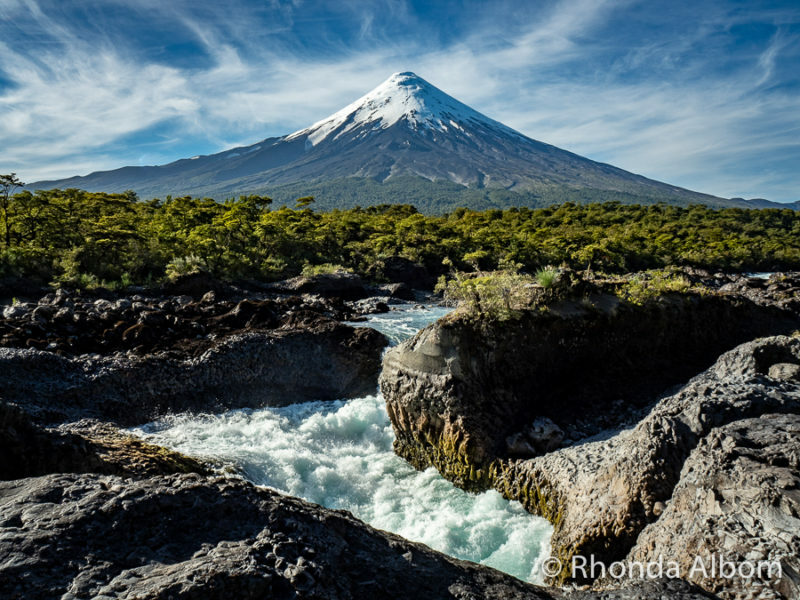 Osorno Volcano is nature’s stunning background of Petrohué Falls. 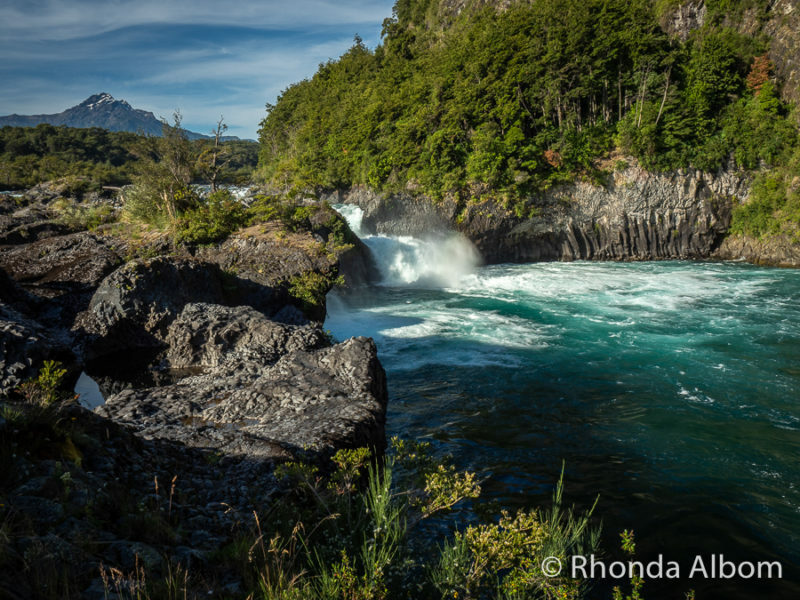 If you get here too late and miss the falls, you can do it as a separate tour from Puerto Varas on a different day. 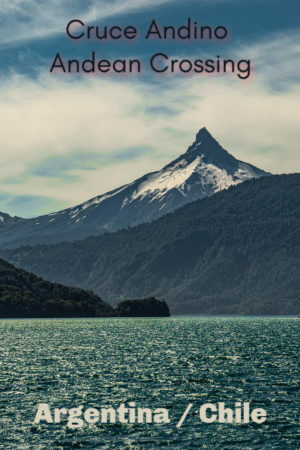 The final hour of our Andean crossing was filled with historical commentary on the Patagonia lakes region, things to do in Puerto Varas, where to eat, and other interesting information, in both Spanish and English. 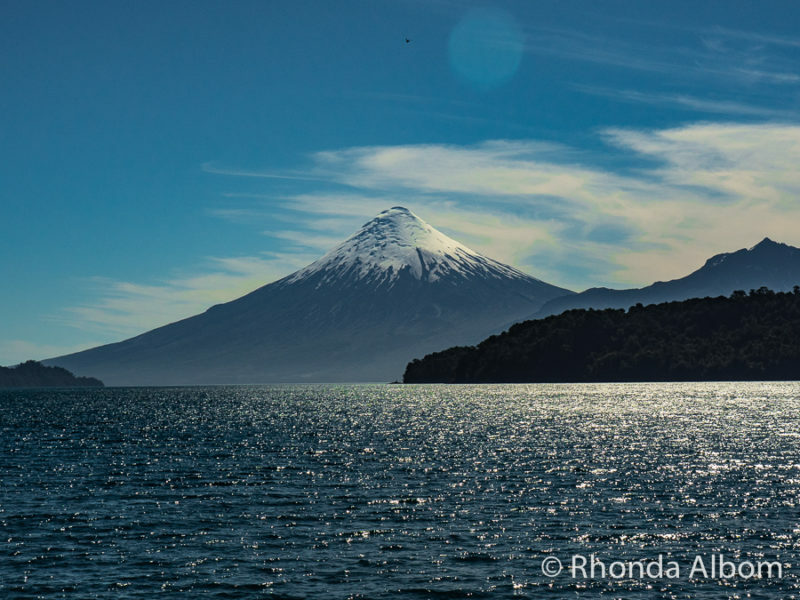 Time flew by, and before we knew it, we were in the delightful town of Puerto Varas. Except where noted, all images on the page were shot with an Olympus OMD em5 and an Olympus 14-150mm lens. This is my primary combination when I travel, as the zoom covers nearly every scenario. A mirrorless camera, it’s a lighter weight and smaller alternative to a DSLR. I, like many photographers, believe it is the camera for travellers, as it offers all the flexibility and manipulation options of the bigger cameras, without the packing hassle. Plus, it easily captures sequences and shoots well in low light. We also carry an Olympus TG5 for when I am around water, indoor shots, underwater photography, and any situation where I feel it is unsafe to carry a larger camera, or just prefer to have only a pocket size camera. Lately, it’s been the camera Jeff reaches for first, as it’s so simple to use, has many optional settings, is dustproof, waterproof, crushproof, and fits in his pocket. Another view of Osorno Volcano seen at Petrohué Falls. 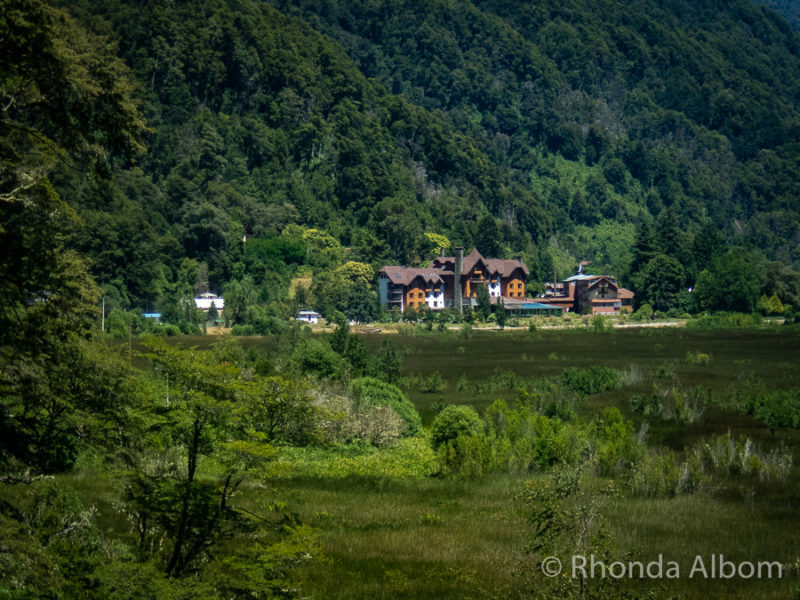 We spent four nights in Bariloche (more to come on this location) at Hotel Ayer Del Nahuel. It’s a three-star cozy accommodation that surprised me in a good way. The beds were super comfortable, but it was the location and the staff that leave me wanting to recommend this place to all my friends. Centrally located, we were only a block off the main square, with one of the best restaurants we have eaten at in a while (El Nuevo Gaucho) right across the street. The staff was wonderful, making sure everyone was happy, while also recommending sites and meals. We spent three nights at this end and stayed at the Bellavista Hotel, a four-star masterpiece overlooking the lake, and just around the corner from downtown. Every room has a view of the volcano. Again, our bed was amazingly comfortable and the staff was very accommodating. We did have one minor issue here, but it was corrected quickly and effectively. They make a fabulous Pisco Sour (a Chilean drink that you must try when in the country), and a decent cup of coffee (not at the same time). 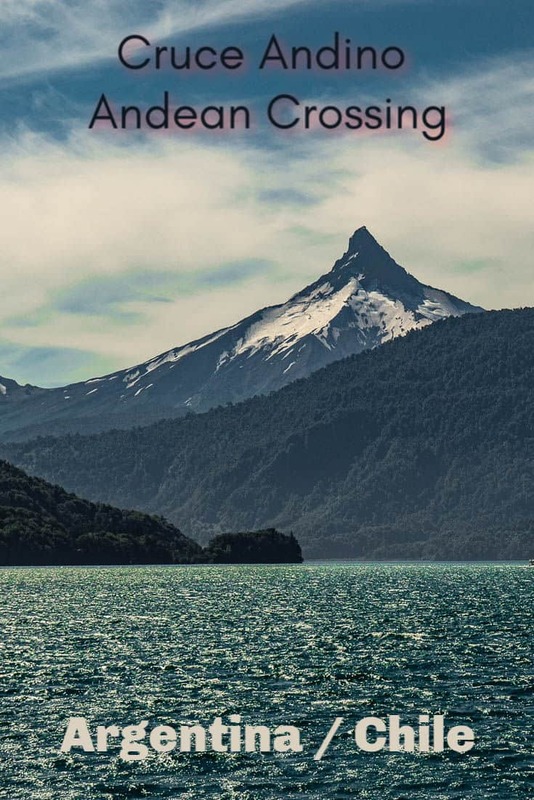 If you are travelling from Bariloche to Puerto Varas you will need 72 pesos in cash per person for port taxes (Price could change). Bring food and water if you are going to want snacks and don’t want to purchase them on the boats. Don’t bring prohibited foods over the border. Chilean customs on the Andean Crossing will open your luggage and search everything. Packing cubes will simplify your life. Wear layers, the weather changes throughout the day. Cruce Andino handles your luggage up until the last bus ride. There was a toilet on the final bus (the only long journey) and the first and third boat. However, there were enough toilet opportunities throughout the day (even for me). Bring toilet paper (always in South America). Pre-arrange transport to your hotel at the end of your journey. Check first to see if it is within walking distance. The Hotel Bellavista (where we stayed) is just around the corner from the Cruce Andino termination point. Great views can be enjoyed from both sides of the bus for each segment. Neither side seemed better. If you are trying to take photos through the glass (I rarely do this), sit next to the window, if not, an aisle seat makes it easier to see both sides. The commentary is in both Spanish and English. I had no internet or mobile service on most of the journey. Remember your passports and visas if you need one for entry to either Chile or Argentina (depending on which direction you head). 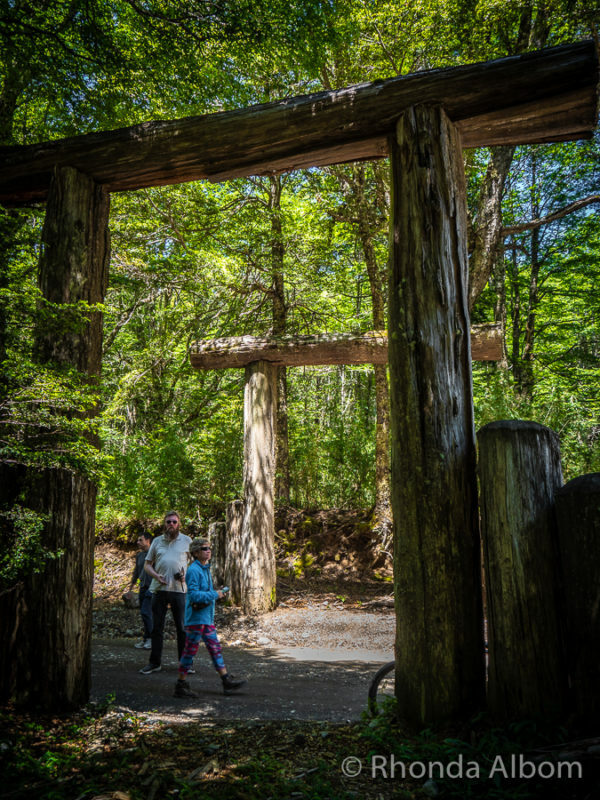 The first modern Andean Crossing between Puerto Varas and Bariloche was completed in the early 1900s and took five days, although archeological evidence shows movement in the area dating back almost 15,000 years. If you want more information, check out Cruce Andino’s official website. What segment of the Andean Crossing will be your favourite? Have you travelled with Cruce Andino? Disclaimer: As media guests of Cruce Andino we were provided with our passage through Turisur. However, the opinions expressed here are strictly my own. How wonderful! This trip is definitely bucket list material for me! So much natural beauty! Sounds like an incredible day. I am a big outdoor and nature lover and know I would so appreciate this type of trip. I’ve been to Chile before, but never to Argentina. Pinning this for future reference. This is such a great post filled with useful information. I made sure to pin it for a future Argentina trip. I know I’d have an enjoyable time since I love boat rides. Those volcano views look stunning. Beautiful scenery and beautiful photos. I’ve not been to South America but I’ve wanted to go to Bariloche for many years after watching a tv show about it and it’s chocolate. Good to know about this in case I ever make it there. Oh my, this looks so lovely. That scenery takes my breath away! I love your photos. Thanks for these awesome suggestions. 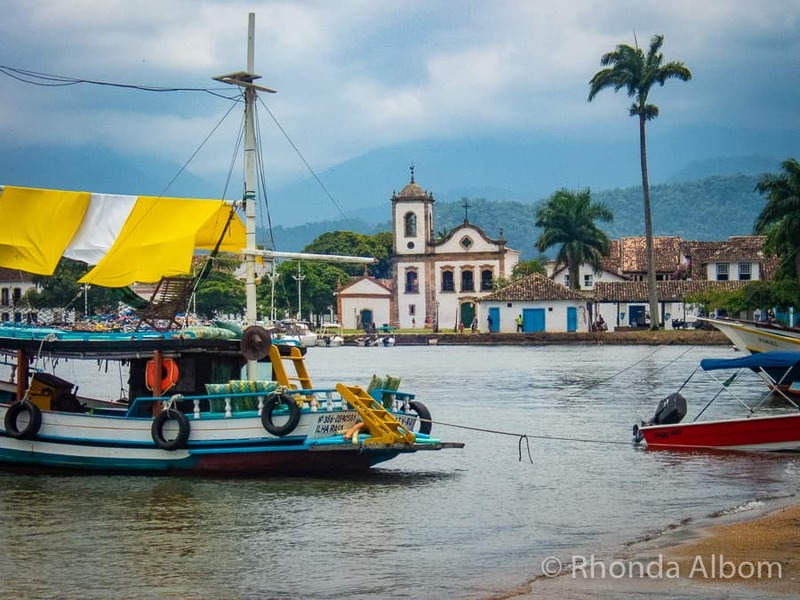 Traveling to South America is high on my list for 2019 and this will be very helpful. We live in Panama part-time and even just going to nearby Costa Rica can be a nightmare with the corrupt law enforcement there. Such spectacular scenery! That is one of the most unusual borders I have ever seen. How fun to feed a seagull like that! This is really beautiful. I can’t believe you were able to snap that shot with the seagull!! That one was shot of me, but someone else. I gave her photo credit above. This looks really cool! 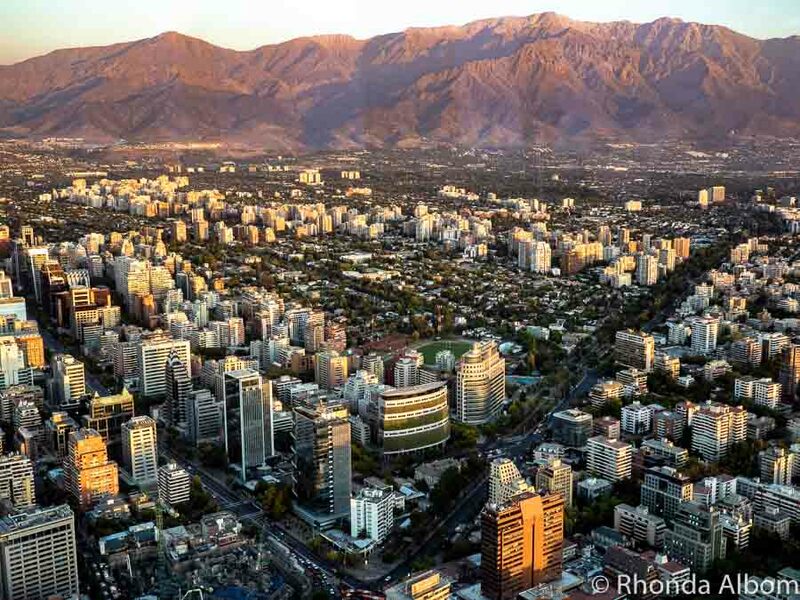 I am hoping to visit Chile and Argentina next fall. Remember to bring warm clothes if you are heading to Patagonia, even in the summer. Thank you for such an informative post. We’ll be travelling (in the opposite direction) in the area next year. What a great idea to take a tour to take advantage of all the great scenery you’re passing through and minimise the stress of making all those transfers on your own. Cruce Andino goes in both directions, and I highly recommend it. It’s a great way to spend a day. 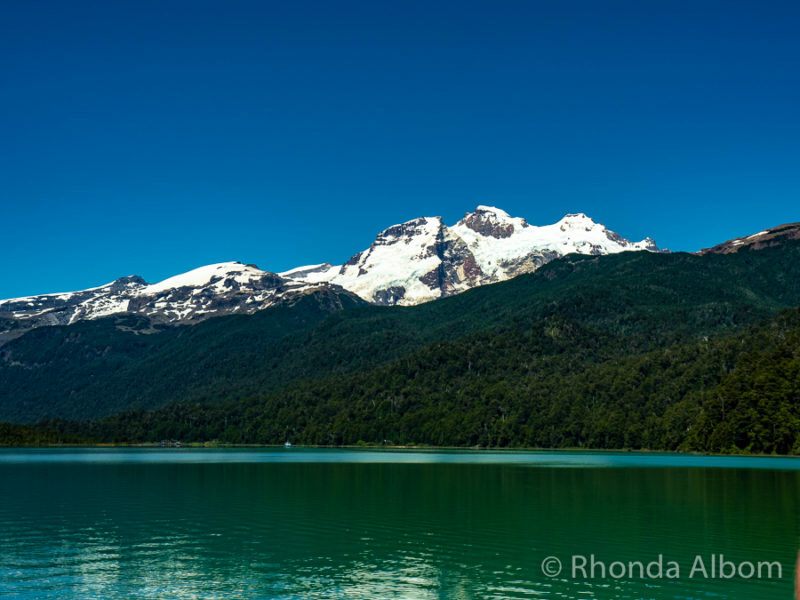 Yes, Patagonia is spectacular. We didn’t see enough of it. 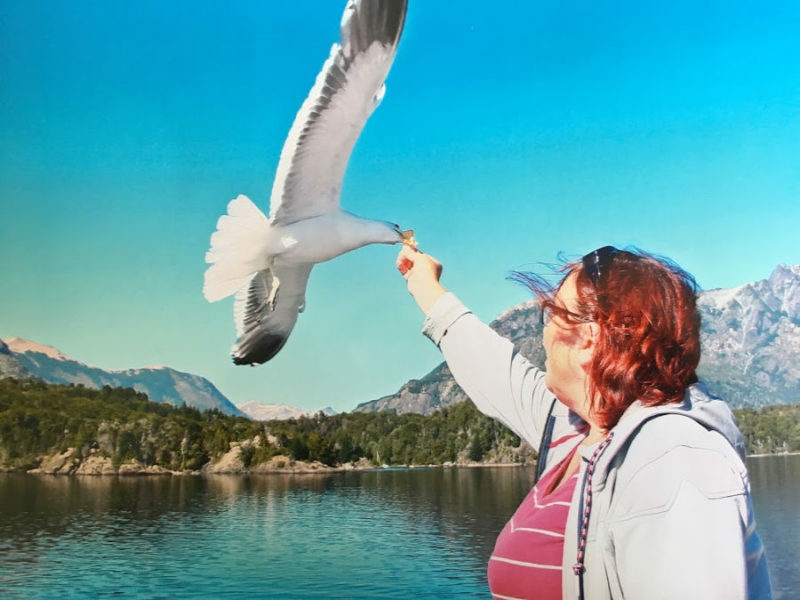 The photo of you feeding the wild seagull is a fantastic shot. The falls are truly beautiful. I would love to visit Cruce Andino even though I don’t do well on boats and buses. The water is lovely. The constant change between bus and boat makes this an easy day, and a fabulous adventure. Wow! This place looks absolutely breathtaking! Looks and sounds like such a great adventure! It really is a great adventure. Wow, what an incredible adventure. I’m sure it was a long day – but you definitely got to experience all kinds of ecosystems and habitats – from the mountains to the lakes. The Orsono volcano shot is especially lovely. How long did the customs inspection take? Glad that you were prepared for that – I would imagine it might be a little unnerving if you weren’t prepared. (I’m so used to being able to move freely between borders in European travels.) Our travels tend to make our suitcases quite the disaster when we move between locations. This is where I can see the value of packing cubes for sure! Customs doesn’t take that long because it isn’t a busy area, not like an airport. I would say it took 20-30 minutes to get the entire group through, but they called names and brought us into the building in small groups, so the wait didn’t feel long at all. I was pretty pleased with that shot and thrilled the photographer gave me permission to use it. Wow, I just added another place to where I need to go. All of your photography is amazingly beautiful. And don’t just do the crossing, spend some time on both ends. Oh my gosh, that looks absolutely incredible! And those shots of the volcano are just STUNNING! Wow that is an adventurous place to be in, so cool. I love the views of lake and mountains. Stunning. Great crossing. I think the lakes in the foreground make the mountains look that much more spectacular. Incredible skies Rhoda. I envy your journey – amazingly beautiful! We actually got really lucky with our crossing day. It rains more often than not in this region, so a nice sunny day is not the norm. These photos are amazing! I can’t believe that is a real place! What an amazing opportunity, I’m sure you’re itching to go back! LOL – we are still in Chile, but north now. And, yes I would love to go back to Patagonia. Wow! What an amazing adventure! Your photos are stunning and I’m suitably jealous!! Incredible photos and colors, especially the rich greens. That photo of you in the gull is fantastic, what a great action shot. Sounds too long for me but it does seem as if all that beauty makes the journey go quickly. I was a bit worried about the time also, but it’s not like the boring long haul flights. This was everchanging, a day of constant adventure. Wow!! Simply gorgeous! 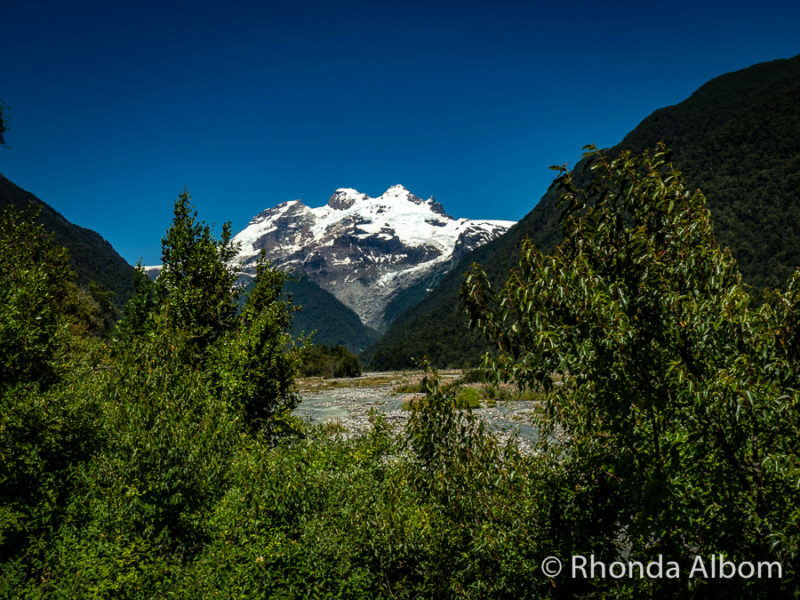 You would never expect some of these ‘Alpine’ views to be from South America! I had the same thought as I went through some of it. Not just South America, but we were down at the 41st parallel. It all looks so amazing! You had me at your volcano shot but i cant believe that seagull!! How fun and whimsical! Were you worried about not seeing your luggage again after the first bus? LOL – I never gave my luggage a thought. Our group wasn’t that big and we could often see the luggage. I worry more when I give it to an airline. Plus, we travel super light. Wow! What an amazing day — gorgeous views and way too many beautiful things to take photos of! Osorno Volcano is a stunning backdrop and the Petrohué Falls are so beautiful too. A day like this would be a welcome reprieve from my usual travel habits — walking 12-15 miles a day and trying to cram in everything! Beautiful. Out on the water on a boat is heaven. Always has been and always will be. Yes, I know you would love the boat segments, and the bus segments are pretty good too. Oh how beautiful! Ten times more than cruising Puget Sound. Yes, but I would be pretty sure it was more than 10 times longer. Gorgeous Rhonda. Those shots are mesmerizing too. I love those blue hues. Nice catch by the wild gull. I dig bus rides; especially in beautiful places. Yes, fantastic and ever-changing are two great words to describe it. Now that’s the way to tour the countryside! A variety of travel and plenty to see. Amazing it is so green. When you think about how much it rains, the green isn’t so surprising. It was just breathe taking. Feeding the seagull was really cool. Honestly, I was a bit nervous that he would bite my fingers, but lucky no, not mine nor anyone else that gave it a try.